Singaporeans are world champions in losing our pants to our casino while we rank number 2 in overall gambling loss. Our per capita loss to the casino is over US$400 while overall gambling loss exceeds US$900. PAP government cheers as more people losing their pants means more tax revenue. 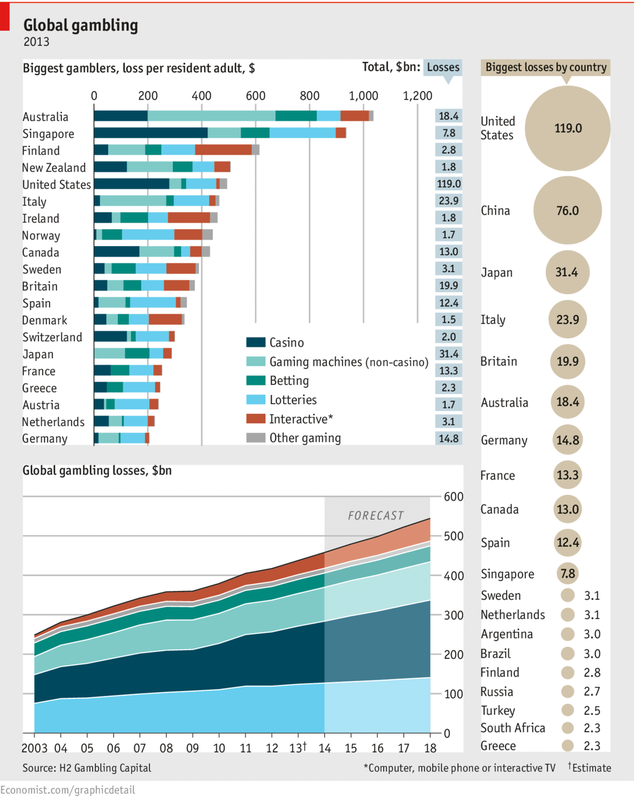 Surprisingly, Macau and Monaco, which derive nearly all of their gambling revenue from tourists, do not make the list. The reason is in Macao and Monaco, her residence do not gamble much, revenue from foreigners. And also unlike Singapore, Monaco has much draconian measures inhibiting her citizen to gamble. As usual, such news are not likely to make it to our mainstream media. Kuan Yew, more than anyone else is fully aware of the harm of casino. Kuan Yew, himself a victim during his child hood as his father Lee Chin Koon was an addict of gambling. Chin Koon and Kuan Yew's mother fought as Chin Koon wanted to pawn his wife's jewellery, after losing his pants. Kuan Yew and his family's greed have grown increasingly after they have usurp the power of Singapore. They decided that casino is the way to go even if that hurts a lot of people. Kuan Yew and son found a shameless and wicked lackey by the name George Yeo. George Yeo is a phoney Catholic who has managed to con Singaporeans to believe that he is intelligent, as well a deeply religious nice guy. George Yeo, for his entire career had only done harm to Singapore, the most important one being, architecturing caste system in Singapore, by flooding us with Indian nationals through CECA. George was a despicable person full of sin. Other than developing caste system for Singapore, he also wanted to destroy our family. He was the foremost advocate for casinos. This brazen display of wickedness and debasement had brought him severe and unusual criticism even within his own party, the PAP, well-known for discipline and public display of unity. George Yeo having a leukemia son could be a manifestation of God's existence in dispensing disaster to wicked people -- though in George Yeo case, he was let off hook too lightly given the number of people he destroyed.